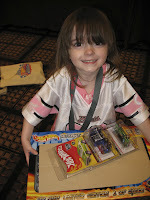 Now that I've had a chance to sift through all my photos of the Hot Wheels Collectors National that we attended in Chicago, I can throw together a decent overview of it. Before I begin, I want to address a question that was presented as a comment to my teaser. Mommytime asked if it's always in Chicago - No. Last year it was in Detroit and next year I believe it will be in Virginia. For anyone living in Southern California, they have a convention there annually also. DH is an avid collector of Dodge Vipers that are the size of Hot Wheels so he follows the collector forums to keep track of what new Vipers have hit the market. 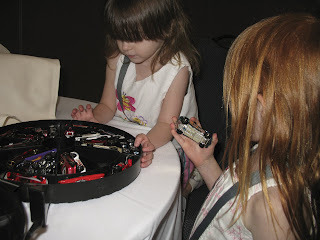 We attended the Collectors National in Detroit last year but the girls were too young to really appreciate it all and nap time tende d to interfere with a lot of it. This year, we decided to let the girls stay up late, attend all kid-friendly functions and really partake in the entire event. They loved it and so did we! The girls remembered the downhill races from last year and were anxious to get started on that. Practice sessions were set up during the week and the actual races were held on Saturday. Didn't really matter because the girls had as much fun during the practice sessions. They got to pick whichever cars they wanted, get into line, hand the guy on the ladder their cars then run to the finish line to cheer on their respective cars. 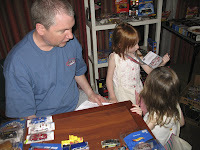 They would return those cars to the case and pick new ones - always asking "Which one is fastest, Daddy?" We paid a little extra to participate in the vending pull session. What's that? 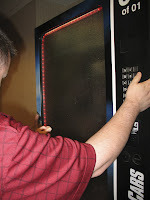 Well, it was a vending machine chocked full of limited ed ition Hot Wheels. The catch? You couldn't see what you were getting. That's the total fun of it. The glass on the front was frosted and it was just a game of chance. We let the girls pick the letter/number combination and push the buttons. Miss K was quite excited to win one of the bonus prizes! 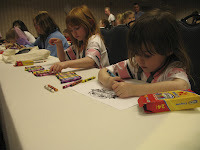 The girls also participated in two different coloring contests. One was sponsored by the convention. The rules are very simple - parents can't help. Period. The kids were grouped by age then awards given out to the top three winners in each age group. I thought the girls did great and it was nice to see their independence during the contest. 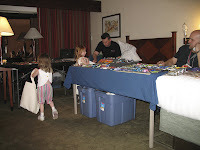 The Collectors National is held in a hotel and throughout the entire event people can open up their rooms to sell stuff... or buy or trade but that's semantics. Anyway, conventioneers set up tables and displays in their rooms, use the desks, the drawers, the beds for displaying stuff and you literally walk in and out of open doors like they are mini stores. It sounds kind of freakish, but it is so much fun that it's ridiculous. If you collect Hot Wheels, this is heaven because you are bound to find something that you don't already have in your collection. That's where the scavenger hunt comes into play. To keep the kids occupied during the down time, the convention folks put together a contest where kids look for about thirty different items. A purple Hot Wheel, a convertible Hot Wheel, a napkin with a logo on it, anything with a Speed Racer logo on it, state quarters for Illinois, Wisconsin and Florida, etc. 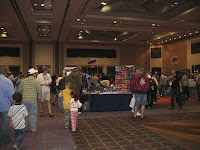 As the kids walked around the convention, they were constantly on the lookout for scavenger hunt items. People who manned the 'stores' were always so generous, offering to fill the bags with whatever the kids were looking for. The catch? None. The charge? None. Was it fun? Like you wouldn't believe. We would enter a room and the girls were responsible for asking for help. They would walk up to whomever they thought the room belonged to and tell the people they were on a scavenger hunt. The list would change hands and they would try as hard as they could to find something from the list. It is an excellent way for the kids to get involved and an awesome way to teach them about manners as well as start to develop interpersonal skills. But wait, that's not all! 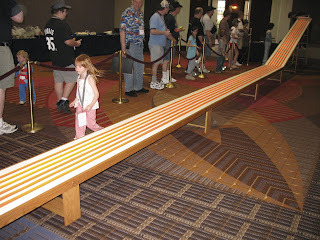 In addition to autograph sessions with the actual Hot Wheels designers , Mattel had a room set up displaying some of their latest products. In that room, you had the opportunity to put your destruction skills at work. An honest-to-God Hot Wheels smusher. What a marketing gimmick that is. Adults could crush their cars, but when kids did it Mattel was kind enough to replace the destroyed car with a brand new one. Whew. 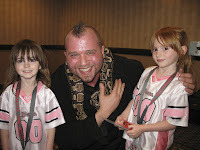 It took me forever to convince the girls to do it but once they did they wanted to keep doing it! The rep from Mattel said that it was mostly boys that thought it was cool. And what event would be complete without a magic show. Miss M was especially fond of Mike D and his magic act. She couldn't stop talking about how he ate a (playing) card. Overall, it was an awesome event and I regret that the next one is so far away. 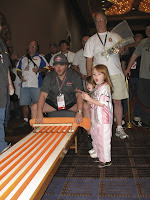 I doubt we'll be able to attend next year, but I can always hope that it will return to the central states in 2010! This sounds like more fun than almost any weekend event I could possibly imagine! I have to keep my eyes peeled for it for next year, as I know my kids would adore it. (So would my husband, truth be told, and I think I would too...) Thanks for the great, detailed review! My older son would have LOVED this event. Please tell me they are planning the next one in TEXAS! Wow, I never even knew this convention existed! Looks like you guys had fun, and I think it is great that your girls enjoy it too. It looks and sounds like you all had loads of fun. I will have to look for something like this for our little one! fun fun fun. thanks for sharing. That sounds like an awesome trip! It's so nice when they get a little older and can participate more in things like this.